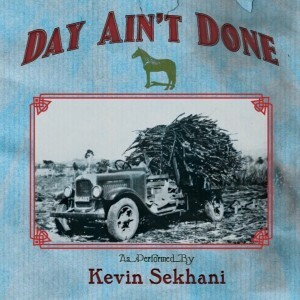 ALBUM REVIEW: Kevin Sekhani, "Day Ain't Done"
This is one fine piece of pure American music – a mixture of country, bluegrass, zydeco with some damned masterful playing and catchy songs. Kevin Sekhani, a Lafayette, Louisiana native, who’s been a mainstay on the Austin scene for years, serves up a dozen high energy and melodic tunes that you just cannot resist/help smiling while listening. Which is important – to have a full album lift your spirits is no mean achievement. Just from the opening cut, which is also the title track, you’re in for a fun ride; upbeat, hopeful and sung with a great deal of gusto; although “Wrong Direction” is built around minor chords, with a “darker sound”, it’s one of those standout tracks that grabs you and makes you listen to it over and over again and “Oilfield Tan” is a fiddle-driven honky-tonk stomper with beefy acoustic guitar. “Jump Right Back” has a ‘5o’s rockabilly feel and a hell of a guitar solo; “The Higher I Get” is pure Louisiana country, complete with tasty accordion figures and “The Kiss” is a tale of naughtiness and betrayal wrapped in an upbeat musical frame. It always makes me happy to hear an album by someone I’m not familiar with and become a fan of. Such is the case with Kevin Sekhani and this fine album.